Although the plateless turtle superficially resembles the soft-shelled turtles, this animal represents a completely different family of which it seems to be the only surviving species. Its shell is only 1 8 inches long and lacks even traces of horny shields. The front flippers have almost lost their toes and become paddle-shaped. Here, again, an animal’s external appearance is not enough to tell us what the closest relative might be. Differences of the internal bones of the shell (missing in true soft-shells) suggest that it may be intermediate between the crypto- diran and the side-necked (pleurodiran) turtles. 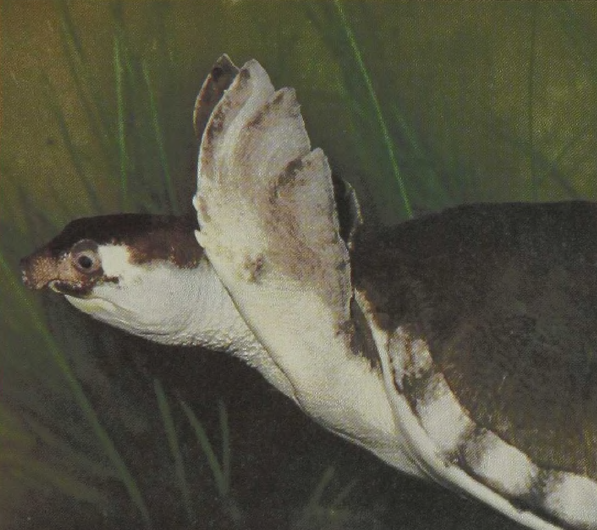 The species is unique among freshwater turtles in that it swims mainly with the forefeet, which have been developed into hydrofoils I ike those of marine turtles, adapting it well for the rivers of New Guinea.